Wilma hit south Florida and never got as far north as Orlando. If you are going to do an Al Gore is full of crap rant, it helps to get you facts correct least you become another Al Gore. Hurricanes are part of the heat transfer process from the tropics to the poles. The process is driven by temperature differentials. If global warming predictions are correct, the differential between the tropics and the poles should become smaller because most of the heating will occur at higher latitudes. From this, one would expect less heat transfer and fewer and smaller hurricanes, which appears to be what's happening. Naples is on the Gulf Coast of Florida. And that's just about where Wilma hit in 2005. Florida had it pretty bad in 2004 also, and the media trumpeted how strong hurricanes hitting us would become the new normal. Its been quiet the past couple years, but we all know the storms will be back. Thanks goodness the media was just as correct as Al Gore. 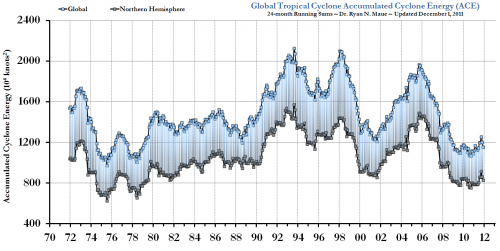 "Hurricanes are part of the heat transfer process from the tropics to the poles." You're confusing the path of a hurricane, with the path of the heat transfer that drives it. That's like saying that internal combustion engines in motor vehicles transfer heat energy from people's homes to their offices and back. Hurricanes are heat engines that transfers heat energy by evaporation, convection, and condensation from the warm tropical sea surface to the cooler atmosphere directly above it. The path of the hurricane across the earth's surface is driven by prevailing winds and atmospheric pressure gradients, and has nothing to do with the heat transfer going on inside the storm. Quote:The path of the hurricane across the earth’s surface is driven by prevailing winds and atmospheric pressure gradients, and has nothing to do with the heat transfer going on inside the storm. It is ironic that the person who really was an expert on hurricane intensity, Chris Landsea, had good technical reason for why warming would not lead to more stronger hurricanes. He resigned from the IPCC when Trenberth, who is not an expert in this area, hijacked the chapter Landsea was working on and had a news conference hyping up the threat at MIT. 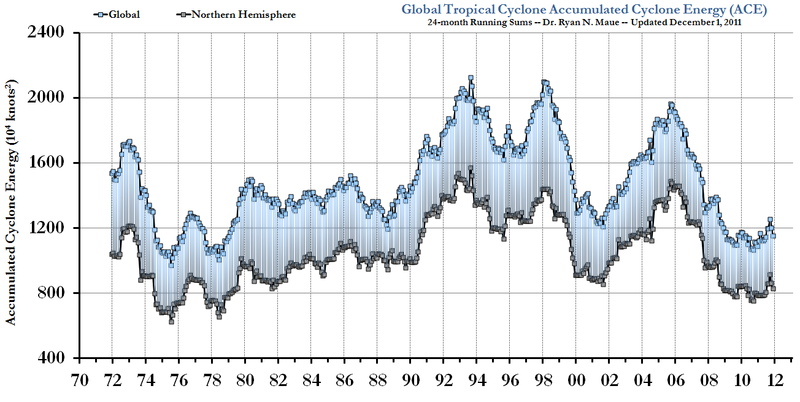 There was a good thread on this over at Watts: http://wattsupwiththat.com/2011/12/02/hurricanes-and-global-warming-opinion-by-chris-landsea/ It goes into the technical reasons, supported by modeling, for why hurricane strength / frequency will be a not be a serious problem in a warming world. Perhaps Dr. Landsea should also be making inquiries to Dr. Trenberth related to missing the missing hurricanes. Maybe they are in hiding with the missing ocean heat. I'm not talking about path. The entire atmospheric flow, all of it, is generated by the pole/equator temperature differential, which in turn is developed by the solar energy flux at the surface. If AGW is correct, the poleward temperature differential will be reduced because AGW predicts that CO2 will heat the temperate and arctic atmospheres more than the equatorial atmospheres. All atmospheric flows will be reduced in strength (velocity), the Trades, Westerlies, etc.